The tables provide population figures for cities and their surrounding urban areas. 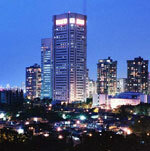 Most such agglomerations are economically, socially and culturally dominated by one city at their centre. Occasionally however, several cities of similar status and their suburbs make up an urban area. The 2020 population figures were calculated using the 2006 data as base and applying annual rates of population changes. The average annual rates of population changes are assumptions based on past growth/decline and forecasts by international and national statistics organisations.